I received my beautiful order over the weekend from Thomas Chadwick Designs on Etsy. He makes the most lovely laser cut jewellery in loads of different designs. My favourites are the Studio Ghibli ones so I went for the JiJi Brooch and a Lucky Cat Necklace as lucky cats are sooo precious. I'm really impressed with the quality of the items. The pendants are incredibly sturdy and thick and the silver chains are so dainty. The jewellery is so well made and very reasonably priced. 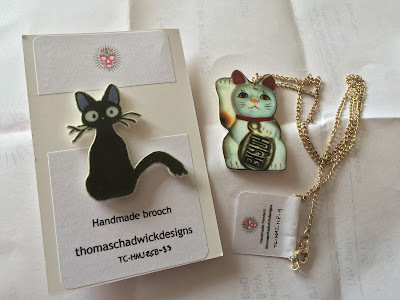 I would recommend purchasing from Thomas Chadwick Designs if you're into Studio Ghibli. The designs are so beautiful and look just as gorgeous in person as they do on his shop website!